Slotsmillion – over 2300 games! SlotsMillion Casino is a very diverse online casino with a clean instant-play interface and a huge selection of more than 1100 different bonus video slots and a total of 2300 games to choose from. 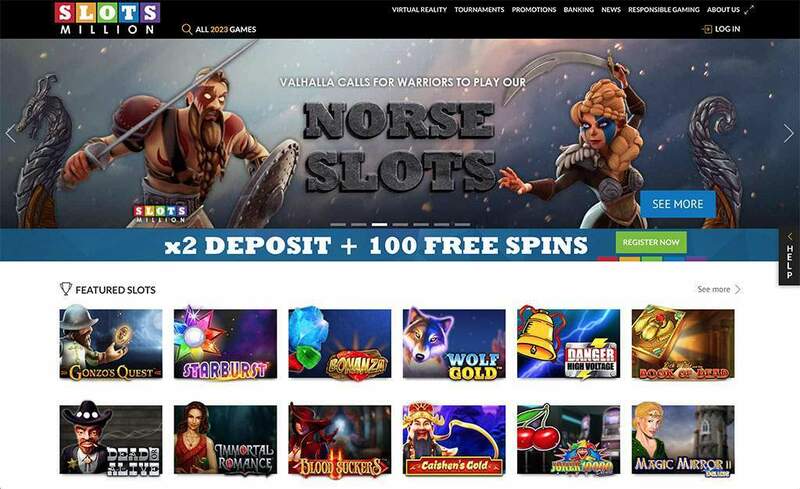 It’s powered by multiple software platforms, including NetEnt, GamesOS, Rival, Microgaming Quickfire, Betsoft, NextGen Gaming, Playtech, Saucify, Leander Games, CryptoLogic, Euro Games Technology, Genesis Gaming, Iron Dog Studios, Red Tiger Gaming and iSoftBet. If you can’t find it here, you might as well give up searching. SlotsMillion Casino is licensed by the following authorities: The UK Gambling Commission, Curacao, and Malta. 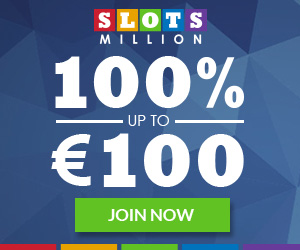 SlotsMillion Casino offers a 100% up to €/£100 + 100 Free Spins. 5 x 20 free spins on Gonzo’s Quest, Twin Spin, Jack & the Beanstalk, Spinata Grande and Fruit Shop. And this casino offers plenty of other exciting promotions such as slot tournaments, ladies’ night, gentlemen’s night and other special treats. SlotsMillion Casino has one of the largest collections of slots on the planet. Players can enjoy a wide range of titles from more than 10 different platforms, each with a variety of themes, paytables, and exciting bonus features. Among the most popular are Immortal Romance, Jack & the Beanstalk, Dead or Alive, Book of Dead and 300 shields. Players can even sort through the games by software, game type, and theme. And of course, all the progressive jackpot titles are there too including classics such as Mega Moolah and Mega Fortune. SlotsMillion Casino specializes in only slots but of course it also offers table games, video pokers, and many other casino games like Baccarat, Roulette, and Craps. SlotsMillion Casino’s customer service team is always available to ensure that no one has to wait long to get a question answered or a problem resolved. Players can get help through the online live chat interface, which offers near-instant communication between 10:00 AM and 00:00 PM every day. Alternatively, players can also call the casino, or email the support team and get a reply within a few hours. Players can rest assured that their personal and financial information will not be compromised at SlotsMillion Casino. That’s because the entire website is encrypted with SSL encryption, the gold standard of online security. It works by obscuring all sensitive details, making it impossible to read or decode information like user details, credit card numbers, banking information, and other confidential data. SlotsMillion Casino selects only games from reputable vendors. All of the slots at the casino have been audited by an independent testing firm to ensure fair play. As such, players can rest assured that the games are all fair and genuinely random. Anguilla, Belgium, Bermuda, British Indian Ocean Territory, British Virgin Islands, Bulgaria, Cayman Islands, Cyprus, Denmark, Estonia, Falkland Islands, France, French Guiana, French Polynesia, French Southern Territories, Georgia, Gibraltar, Guadeloupe, Guam, Guernsey, Hungary, Isle of Man, Israel, Italy, Jersey, Martinique, Mayotte, Montserrat, Netherlands, New Caledonia, Northern Mariana Islands, Pitcairn Islands, Poland, Portugal, Romania, Russia, Réunion, Saint Barthéley, Saint Helena, Saint Martin, Saint Pierre and Miquelon, South Georgia and the South Sandwich Islands, Spain, Turks and Caicos Islands, U.S. Minor Outlying Islands, U.S. Virgin Islands, United States, Vanuatu, Wallis and Futuna, Yemen. SlotsMillion casino carries our reward of excellence seal that is only awarded to online casinos that meet our standards with an average of 8/10 or higher. With this seal we also state that SlotsMillion is a fully trustworthy casino with a good service for its players.